Age 84, of Haslett, MI, formerly of Holt, MI, was born December 6, 1934. On January 21, 2019, the angels came and took her beautiful soul home. She is survived by her sons, Michael Bullion and David Bullion, both of Florida; sisters, Jan Pickell of Bath, and Rhonda Vanek of Haslett; as well as several grandchildren, great-grandchildren, nieces and nephews. Charlotte was preceded in death by her parents, Vern Wright and Alice Wright Mears, and her dear friend, Bev Musolf. She worked for 7 years driving handicapped children, and then retired after 25 years of service as a bus driver for Holt Schools. 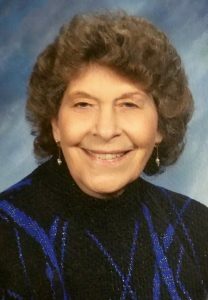 She loved animals, sewing, quilting, and doing puzzles. Charlotte had a quick wit and was a great conversationalist. She remembered all her students’ names and was known for buying them shoes and boots when they were in need – a true giving, loving woman. The family would like to thank the staff of both Home Sweet Home and Grace Hospice for their loving care. There will be a celebration of life service held at a later date in the spring. Memorial contributions may be made to the Ingham County Animal Shelter. Arrangements are by the Estes-Leadley Holt/Delhi Chapel. So sorry about the passing of Charlotte, my former aunt. She was always a sweet person, and I have nothing but fond memories of her. I hope there is a way that I can learn about the memorial service to be held in the spring. Jan I am sorry for you & your families loss of Charlotte. You will be in my thoughts and prayers. I’m sorry to hear this beautiful lady has left this earth. My thoughts go out to the family and friends. Hugs to all. She was always a pleasure to work. May the Lord grant her peace. Thank you so much for the privilege and honor of being part of her life and care. She will be missed and fondly remembered. It was a joy to get to know Char as her Hospice Chaplain. She was a wonderful storyteller, and loved people with her whole heart. Prayers for the family continue.